Our lives are a continuous journey of faith formation. We encourage youth to explore the many questions they encounter along the way so that God might lead them to discover meaningful, faithful answers that make help them make sense of their lives. As we share in faith formation with our youth, we will use the avenues of Discipleship, Worship, Mission and Fellowship. Large group gatherings, small group sharing, service adventures, individual relationships, and partners with other groups are all ways that our youth grow in their faithful relationship to Christ. Many programs are made possible by the Crossways Endowment for Youth Values Development. Youth, join us as we journey together! Check out the Youth Calendar for the current semester. If you have questions or would like to learn more about the Youth Ministry at OPPC, contact Rev. Jenni Crowley Cartee. Camp Friendly, OPPC’s summer camp. It is held one week during the summer at Camp Pyoca in Brownstown, Ind. 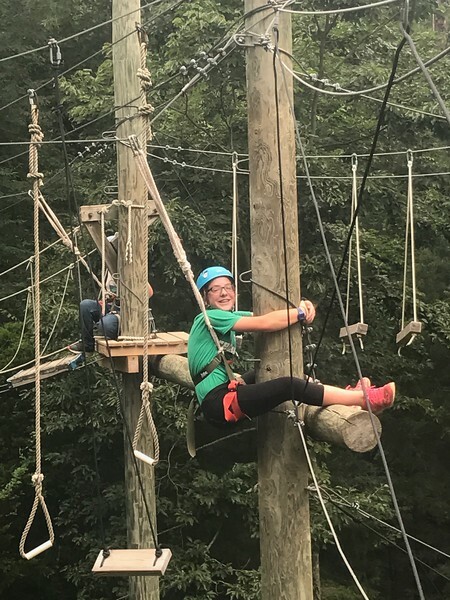 Two individual programs, known together as “Camp Friendly,” are held concurrently: the original Camp Friendly, for third through fifth graders; and Junior High Leadership Camp for sixth through eighth graders. For additional information about Camp Friendly, visit their website. Our camps are about friends: making new friends, rejoining old friends, and learning how to play, work, and live together as friends in Christ. Camp Friendly is open to all, not just members of OPPC. We encourage campers (especially younger children or first-time campers) to “buddy-up” and recruit a friend to come along for the fun! Youth Caravan is our annual summer mission trip for youth completing grades 8-12. Each year we travel to a new location and spend a week engaging in various mission projects including home rehab and repair, food pantry assistance, leading children’s programming, etc. Some previous Caravan locations have included South Dakota, Tennessee, Maryland and New Jersey. For more information about our next Caravan, please contact Rev. Jenni Crowley Cartee. Confirmation class for 7th and 8th graders meets every Sunday from September through May during the Sunday School time (10:10 a.m. to 11:00 a.m.). We use the new PCUSA curriculum "Big God, Big Questions" along with other resources. Students are welcome to participate in the classes with no obligation to join OPPC or be confirmed at the end of their 8th grade year. This is a personal decision that youth may make during the confirmation process. The curriculum used for this class is very age appropriate whether or not the youth is planning to become a member of Orchard Park Presbyterian Church. All students also choose a Faith Mentor to partner with them for their Confirmation journey. Any OPPC member over the age of 22 can serve as a Faith Mentor. Students and their Faith Mentors will choose a number of activities to complete together as they grow in faith! Those completing 8th grade will be invited to be confirmed as members of OPPC if they so choose.